Fall is the time for rustic decor projects in muted tones of autumn leaves. 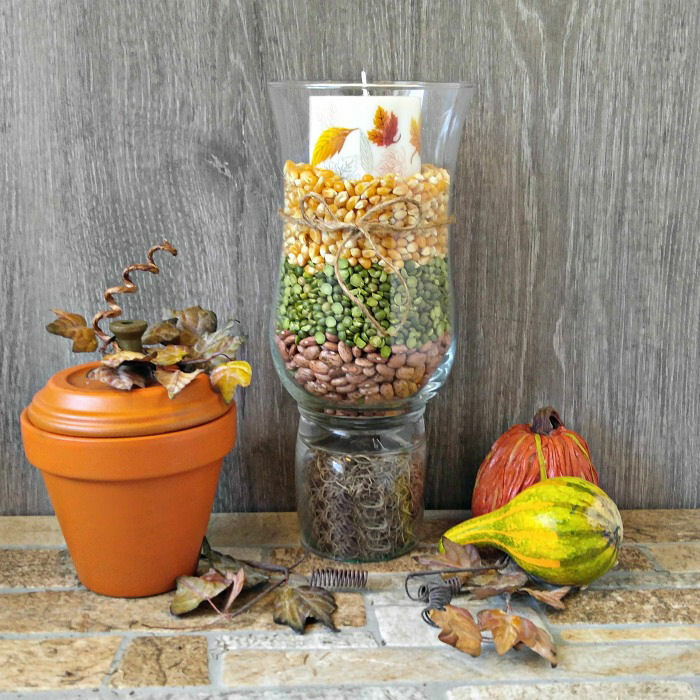 This hurricane lamp fall centerpiece combines the colors of fall into a super quick and easy to make rustic table decor that will grace any autumn table. It would look lovely on a Thanksgiving table. Fall is just full of colors and natural elements that make them the perfect choice for supplies to use for autumn decorating. I enjoy making inexpensive home decor projects that can be put together in minutes but still look nice when displayed. 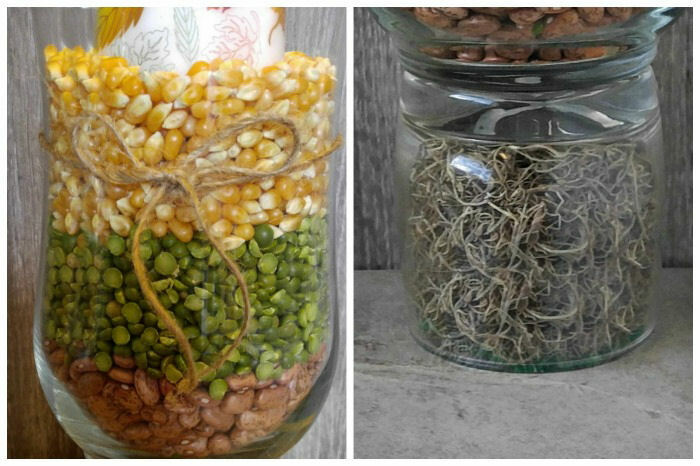 You don’t have to purchase expensive craft items for this easy project. I just opened my pantry and there were my fall colors! 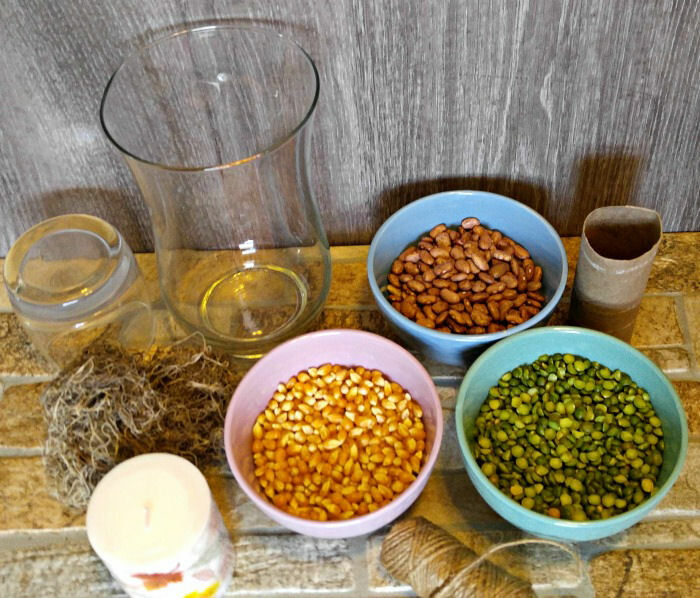 Beans, split peas and popcorn go perfectly together and have just the look I want for this project. 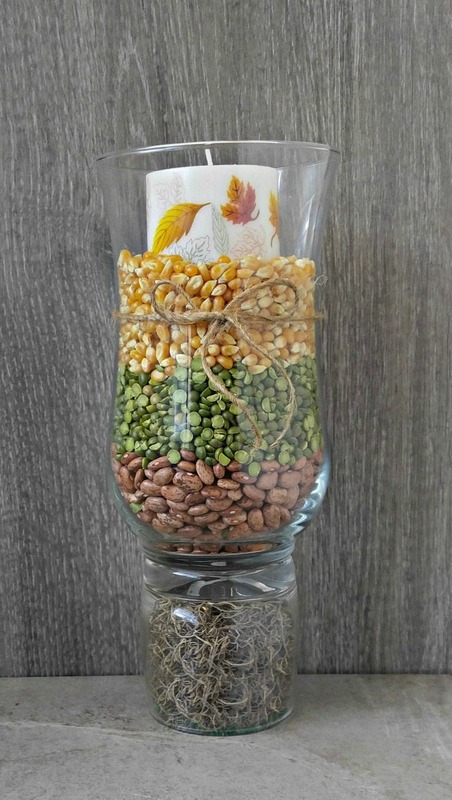 Making this hurricane lamp fall centerpiece is quick and easy. To make this project, you’ll need just a few supplies. 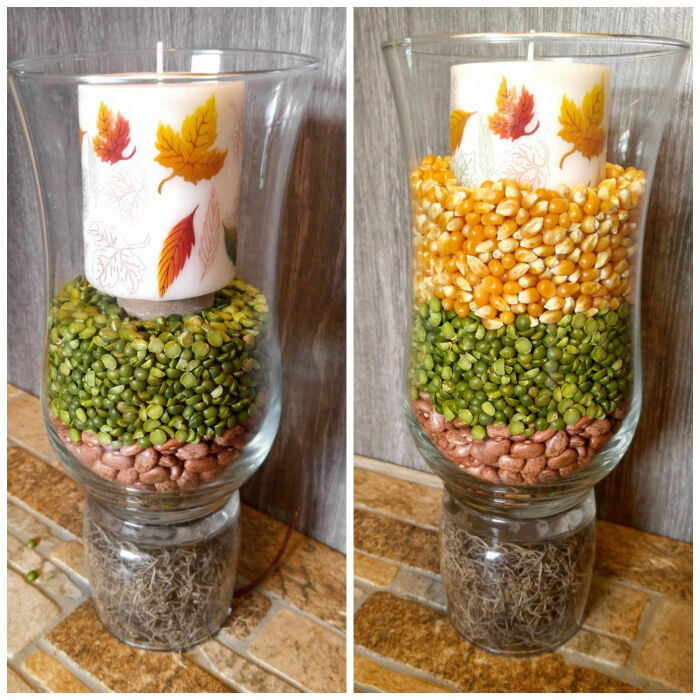 I gathered my beans, a glass and vase, an old toilet paper tube, some moss and jute, and a Dollar store candle with autumn leaves on it. 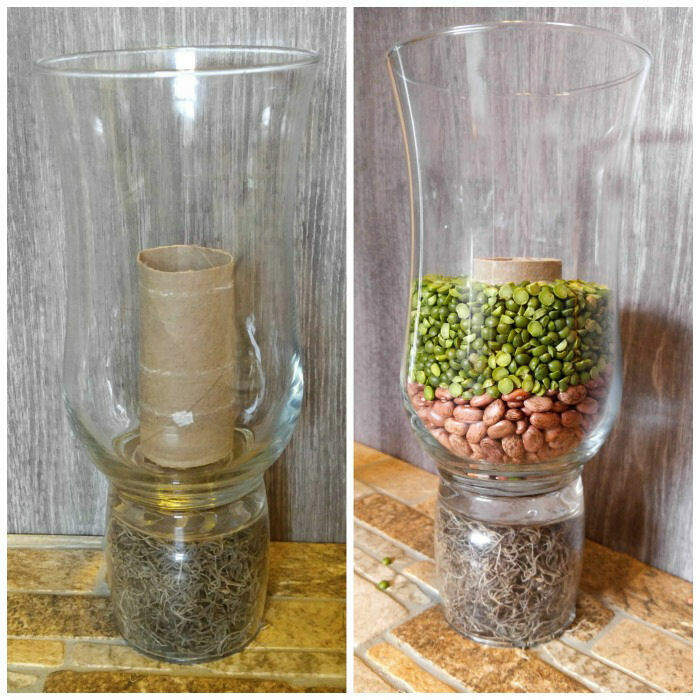 You could even use an existing vase and tumbler that fit together in size and not bother to glue them, if you are in a pinch for time and want to re-use your materials. To give the candle something to sit on and allow me to use less beans and peas, I inserted an old toilet paper tube in the center and tacked it in place. It was exactly the height to match my vessel but if yours is smaller, it might need trimming to allow the candle to sit at the right height. Beans went in first, followed by green split peas. I also added some moss to the lower section for a rustic look. Now put in the candle and pour the popcorn as the top layer. The leaves on the pumpkin go nicely with my colors! I still can’t believe I bought it for just $1! The final step is to tie a piece of jute around the center in a bow. I also cut out a piece of felt and pushed it under the moss to keep it from ending up on my table underneath. No need for glue, It stuck to the moss just fine. Tada! This pretty fall hurricane lamp centerpiece cost me less that $5 and took all of about 20 minutes. I love the way it turned out, don’t you? 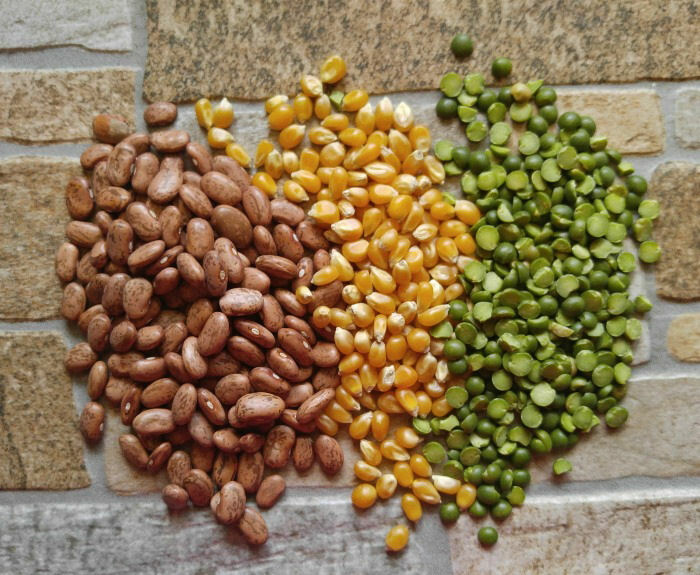 The dried beans and seeds combination seem perfect for the mood of Thanksgiving. Time to stage my hurricane lamp fall centerpiece. I love to use existing decor projects to make little vignettes for my projects. In this case, some gourds, and my clay pot pumpkin add just the right bit of extra decor to this centerpiece. A few dried leaves that match my pumpkin complete the scene giving me a lovely rustic fall look..
Have unexpected guests coming over for dinner? 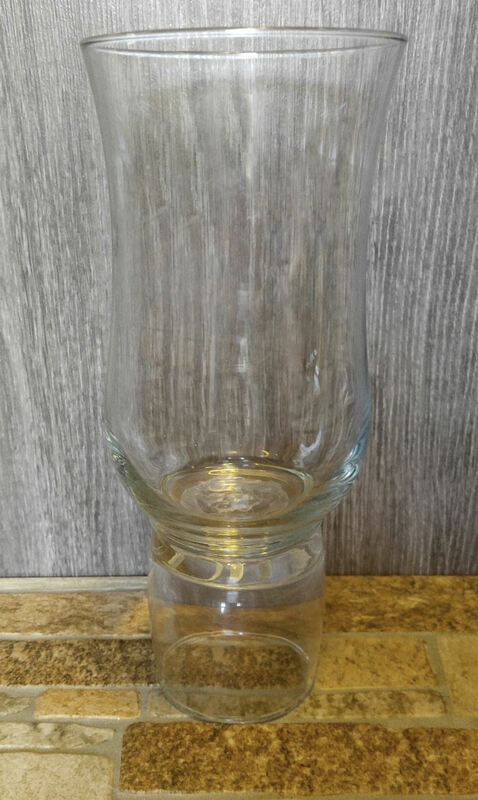 If you are looking for an easy project that will add some seasonal decor in a hurry at very little cost, try making this hurricane lamp centerpiece. Your friends will love it and will never know that you put it together in less than a half hour!